Referred employees have higher retention rates and increase employee engagement in their organisation. An employee referral program is a recruiting strategy where current employees are rewarded for referring qualified candidates for employment. Employee referral programs are popular due to lower overall recruiting costs and a high return on investment. A successful employee referral program can also lead to higher employee satisfaction and retention rates. Most employers will have a delivery system in place that communicates the open positions and the type of reward available for referring a candidate for those positions. Many programs require the applicant be hired and work for the company a specified amount of time before the reward will be paid out to the referring employee. The reward is often monetary, but could be in nonmonetary form such as an extra day off with pay, gift cards, etc. Some companies vary the amount of reward depending on the job level. For example, if an employee refers a staff employee, they might receive a different reward from an employee that refers a management-level employee. Some programs may prohibit managers from receiving a referral for positions in which they have hiring authority, or prohibit HR personnel involved in any recruitment or hiring decisions. Appointment letter is also called ‘job offer letter’ or ‘job letter’. 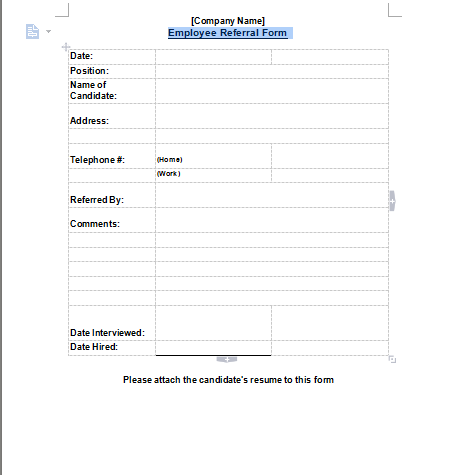 Appointment letter is also called ‘job offer letter’ or ‘job letter’.